Do you make serious money from your blog? About 90 percent of bloggers will answer no to the first question, and many of those will also answer no to the second. Making money online has never been more difficult. All of the methods we used a few years ago have become incredibly ineffective, leaving bloggers scrambling for new ways to earn. Many of them have stopped blogging completely. You don't want to stop blogging, do you? The good news is that you can, indeed, earn a decent income while blogging. In a recent guest post I talked about getting people to buy from your blog, which is a great way to turn traffic into money. But today the focus is not on how to make money from your blog, but rather why you're not making money right now. The old adage claims that content is king, but that's not necessarily true. It is at least prince, but there is one element that is probably more important: design. Think about it this way. If you visited a site that was poorly designed, would you even bother to read the content? Chances are you'd just leave and think that the page was spam. If your site isn't well designed, it doesn't matter what kind of content you have. Thankfully, there are many resources for fixing your design problems. Chandeep recently wrote a guide about design mistakes bloggers make, and it covers a lot of basics that I see on too many blogs. Most particularly, image sizes and fonts are the biggest errors that bloggers make. Make your text easy to read, and people will read it. It's really that simple. Navigation falls partly under design, but it is also a category unto its own. A website is not just a single page, but rather a series of pages that link together -- which is why they call it a web. Yet too many bloggers make the navigation process far too difficult. If people don't know how to get around your site, how are they going to become regular readers or customers? When people can't find their ways around, they tend to leave. What irks me most about poor site navigation is that it's so easy. The WordPress engine allows you to add a full and robust navigation menu, complete with drop-downs, on every single page of your blog. So why not take advantage? Create navigation bar entries for your most popular pages. Add drop-downs for categories and tags. Make sure there's a clear and click-able "home" button. In other words, make sure that you can get essentially anywhere on the site, no matter your current page. To repeat, selling stuff is probably the most effective way to make money blogging these days. Your readers are your potential clients. You can use your blog in large part to inform and entertain them, and in small part to steer them towards your products. It is a balance that has worked for many a blogger seeking to make more money than is available through CPM advertising. Yet even bloggers who get the balance right sometimes don't execute the sale correctly. The No. 1 rule for any sales process is to make it as easy for the customer as possible. Don't make them fill out extra forms. Don't make them hop around to different sites. The fewer steps between adding an item to a cart and successfully completing an order, the better. Offering more ways to pay also helps. Sure, PayPal might work for some, but not for all. Offering mobile payments is another way to make things easier for your customers. Ease leads to sales. It's the one lesson any online businessperson should never forget. In the mid-00s there was a gold rush on the internet. Google had risen to prominence, and by 2003 or 2004 it was driving obscene amounts of traffic. If you ranked highly for a commercial search term, you were almost guaranteed sales. That's when SEO really took off. Of course, when Google realized all the money people were making within its ecosystem, it decided it wanted a larger slice of that pie. In recent years they have made it much more difficult to rank for highly commercial search terms. This is a problem for bloggers who create their sites with an eye on ranking. Those practices have been flagged by Google. Bloggers who used them in the past have been penalized, and those who continue to use them will continue to get penalized. While you might not rank as highly as before, it is highly recommended that you follow Google's guidelines for high quality sites. Google shouldn't tell you how to make your site, but you should also recognize Google for the potential sales it can bring -- if you do it right. When people buy something, they want to know the source. Big brands have a huge advantage here. They're instantly recognized, and so people trust them more naturally. When you're a blogger trying to sell products or even services on your site, you have to be forthcoming with people. So smile for the camera and be prepared to divulge a lot about your self. The more people get to know you, the more likely they will be to trust you with their money. When you design your site, leave room for a headshot on the front page. Tell a full story on your About page. Not just what you do, but who you are. Provide your email address. Contact forms just don't cut it. 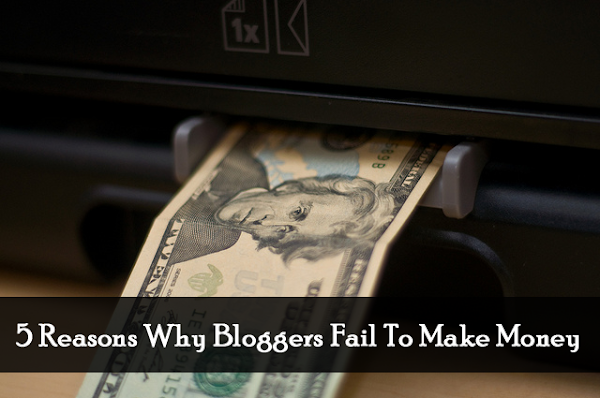 If you're failing to make money with your blog, chances are you're failing at one of the points listed above. As far as I've seen, they're the biggest reasons why people fail to make money online. Let me know do you experienced any of them or do you have any other reasons that blogger fail to make money. Joe Pawlikowski has been blogging since 2005, when he launched a free blog on the Blogspot domain. He now writes and edits for several blogs, earning his living through blogging and consulting. He keeps a personal blog, A New Level. And without linking to any social profiles ! Anyways, Great Article And Your new design is awesome Chandeep ! But, you know one thing . Its cloned again by a website ! Can i write a guest post at your blog ! You can check my blog and my writings ! Then sure you can write on BTNT just check our Guest posting guidelines before creating the article. Chandeep, You are right. You should Change this template or update it. Hello. Sorry for the OOT comment. I have problem with your modified template, CopyBlogger V2. I just installed in on My blog. It's nice and responsive, but something wrong with my table. The borders are all gone. What happen? Which CSS should I edit or remove? And, for the text inside the table, it's all in the middle. I need it to be on top. I have add valign='top' on my post, but it didn't work. Yeah ! Really Every Bloggers Will Surely Fail Getting Money. They Enter Blogging In The Hope To Drive Money Just By Sitting With Less Work...But it's really much difficult to work with blog. Really the points are too much awesome. And most of the agreed and lovable points to not here is the first one, that is horrible design. Some bloggers just see whether theme is good or not and will surely forget to check whether it is ad optimized and other. Again a nice one. very good and useful tips. I am using your sensational blogger template. But my adsense ads are not display in my site. motivating and good guide ! Its really Interesting News Thanks to share!!! yup man you are right sometimes it done and blogger broken totally without earn money..
Its a necessary to create a eye catchy design. Your current template is awesome. I have learnt from this. Nice tips you have here and am sure it will really benefit new bloggers who are starting out. One after another I failed, Can you please suggest me why am i failing . I want to ask. how does it make a line in the post? I wanted a lot to learn from you.